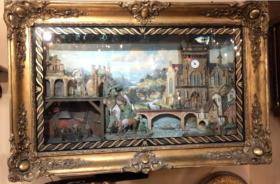 This wondrous French animated and musical painting clock depicts a rural town set in the mountains. 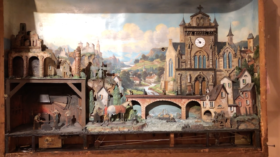 An 8 day striking clock resides in the church tower, and a second clockwork mechanism plays as a carillon on tuned rods. The animation itself is driven by two clockwork mechanisms. 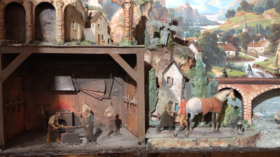 To the left of the scene is a blacksmith shop with a worker pumping a bellows, and another forging horseshoes at an anvil. Outside the shop is a horse being shod who nods his head, while an onlooking dog wags his tail. 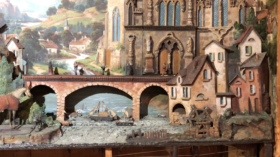 Within the landscape is a spinning windmill and turning waterwheel. A procession of people cross the bridge while boats float down the river below. 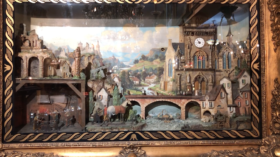 The complex diorama of motion is accompanied by a large cylinder music box playing four tunes.